Caesar haircut is a style that managed to survive though ages and gain a fresh twist these days! This haircut is the fresh trend you are bound to try out! What Is A Caesar Haircut? Certain hairstyles stand the test of time, and the caesar haircut is definitely one of these renowned styles. There is a popular thought that men’s haircut number is a lot less versatile than those available for women. Well, to tell you the truth, the numbers may be a little lower, but it certainly does not mean that there is nothing to choose from. That is why today we are going to discuss something as trendy as Caesar haircut and all the things that you are bound to know about this cut. Once you discover this new style, there is no way you will be unable to experiment with your hair every now and then! Many of you may wonder why Caesar’s name used to name this cut? The truth is that is how ancient the cut is. It is said that Julius Caesar used to wear such a cut to hide away his baldness. The most peculiar thing about this haircut is the fringe that defines it. At first, it may seem that fringe is not entirely what you are looking for, but you should at least give it a try since there is much more to it than just a fringe and it can be suited to all the tastes and preferences. The fact is that Caesar cut is more than popular these days that is why when you are headed to the barber’s shop your stylist will surely know what you are looking for exactly. But in order to make things clearer, we are going to tell you about a few defining features of this cut. As it has been already mentioned there is a need for a square fringe in front. Usually, the rest of the hair is cut at the same length but not necessarily. This is a pretty short cut, but the length of modern Caesar cut may vary from 0.5 to 3 inches depending on your presences. However, since it is considered to be a short cut it is flattering to most hair types and textures so that you do not have to worry that it won’t suit you. There are men haircut kinds that require a lot of maintenance and that is what scares most men off, since very often men wish to spend as little time on fixing their hair as possible. That is when Caesar cut comes in more than handy. There is nothing to fix apart from working some hair product into your hair. As simple as that, just add some fav wax to your hair and fix the fringe up or smooth it out, depending on the result you wish to achieve. There you go! Identity theft. ?? They say you can’t buy style! You can at Danny&Co £15 skin fades. ??? 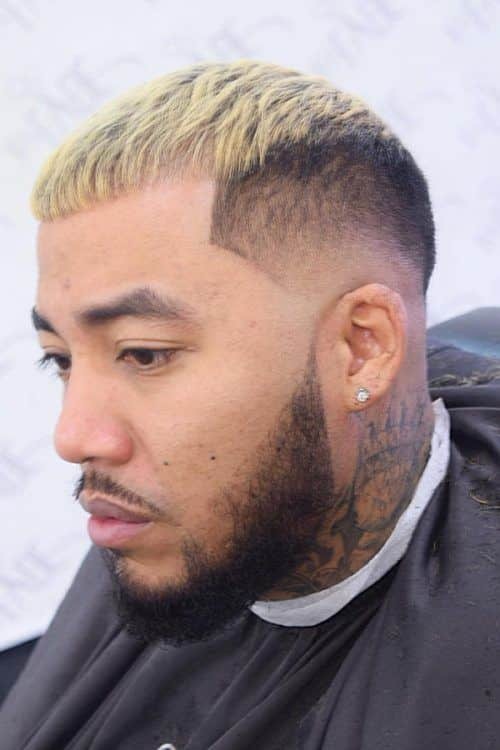 The fade haircut is on the edge of popularity these days, and there is no wonder why since you can easily mix it and match with a great lot of other hairstyles and Caesar haircut is not the exception. In case you are looking for a cut with the lowest maintenance involved then the addition of high fade to the haircut will fix the issue just like that! 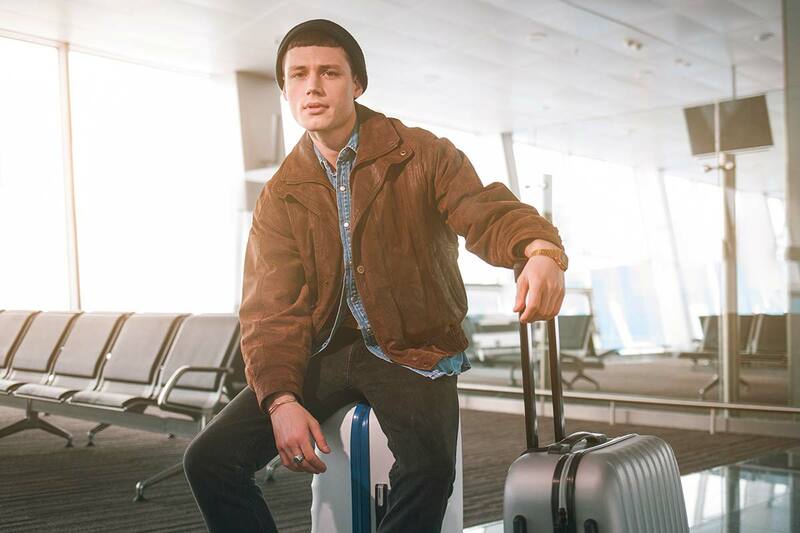 Looking for haircuts for men with curly hair may be tiresome sometime, but not if you know of perfectly short haircuts for curly hair and Caesar one is certainly the one you need. Caesar haircuts for curly hair men take care of all the annoying hair at the back while leaving the party at the front. See for yourself! Not all the short haircuts for wavy hair as gorgeous as this wavy Caesar haircut. It seems that there is nothing out of place about this haircut. The length, the texture, and the style seem to match each other. Simple perfect! There is a time when there is too much or too little volume to deal with, and you are faced with the choice to opt for something suitable but not that trendy or…Or you can choose the perfect French crop with will either add what is missing or will take away the excess volume. Fancy that! 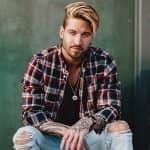 Men’s hairstyles for straight hair sometimes may be tricky as well because not everyone is dying to try something too sleek. In a time like these, you can upgrade straight hairstyles with textured fringe and while everything else look sleek and smooth the layered fringe keeps the style and the charm. Short choppy hair is a great option for those of you who are trying to pull off that messy look that I son the edge of popularity these days. What is short choppy layered hair looks pretty sassy no tot mention stylish! Asymmetrical hair is definitely popular among the ladies these days. However, it asymmetrical short hair looks great on men too. That is why if you are looking for something unusual yet trendy then asymmetrical fringe is exactly what you need, besides you can always experiment with shading to add some extraordinary vibe to your outlook. Grey hair breaks all the records on requesting nowadays. That is why apart from a trendy cut we suggest you think about the trendy coloring as well. What is more an undercut with the surgical line will surely make you look special with this Caesar haircut! Natural hairstyles black hair may be tricky to succeed with, but among all the short haircuts for black men, Caesar one is surely the best. Just a mid fade cut and a small fringe will help you achieve that stylish vibe that many are just looking for. Try it out, and you will not regret it!